You may have heard the phrase ‘the best code is no code.’ While we don’t recommend not writing any code at all, the code you do write should be adding unique value to your app rather than replicating common boilerplate code. The Android Support Library is one of the best resources for accomplishing this by taking care of the little things for you. The latest release of the Android Support Library is no different, adding a number of extremely helpful components and changes across the Support V4, AppCompat, Leanback, RecyclerView, Palette, and Renderscript libraries. From the new AppCompatActivity and AppCompatDialog to a new guided step flow for Android TV, there’s a lot to get excited about in this release. The Support V4 library serves as the base of much of the Android Support Library and contains many of the classes focused on making backward compatibility much easier. DrawableCompat now brings drawable tinting back to API 4: simply wrap your Drawable via DrawableCompat.wrap(Drawable) and setTint(), setTintList(), and setTintMode() will just work: no need to create and maintain separate drawables only to support multiple colors! In addition, we’re making some of the internals of Palette available to all via the ColorUtils class, giving you pre-built tools to better work with colors. ColorUtils makes it easy to calculate the contrast ratio between colors, determine the minimum alpha value to maintain a minimum contrast (perfect for ensuring readable text), or convert colors to their HSL components. Interpolators are an important part of any animation system, controlling the rate of change in an animation (say accelerating, decelerating, etc). A number of interpolators were added in Lollipop to android.R.interpolator including fast_out_linear_in, fast_out_slow_in, and linear_out_slow_in: important parts of building authentic motion. These are now available via the Support Library via the FastOutLinearInInterpolator, FastOutSlowInInterpolator, and LinearOutSlowInInterpolator classes, making it possible to use these via code for all animations. In addition to those pre-built interpolators, we’ve also created PathInterpolatorCompat, allowing you to build quadratic and cubic Bezier curves as well. This release also moves the Space widget from the GridLayout library into Support V4, making it available without requiring a separate dependency. The Space widget is a lightweight, invisible View that can be used to create gaps between components. The AppCompat Support Library started with humble, but important beginnings: a single consistent Action Bar for all API 7 and higher devices. In revision 21, it took on new responsibility: bringing material color palette, widget tinting, Toolbar support, and more to all API 7+ devices. With that, the name ActionBarActivity didn’t really cover the full scope of what it really did. In this release, ActionBarActivity has been deprecated in favor of the new AppCompatActivity. However, this wasn’t just a rename. In fact, the internal logic of AppCompat is now available via AppCompatDelegate - a class you can include in any Activity, hook up the appropriate lifecycle methods, and get the same consistent theming, color tinting, and more without requiring you to use AppCompatActivity (although that remains the easiest way to get started). With the help of the new AppCompatDelegate, we’ve also added support for consistent, material design dialogs via the AppCompatDialog class. If you’ve used AlertDialog before, you’ll be happy to know there is also now a Support Library version in support.v7.app.AlertDialog, giving you the same API as well as all the benefits of AppCompatDialog. The ability to tint widgets automatically when using AppCompat is incredibly helpful in keeping strong branding and consistency throughout your app. This is done automatically when inflating layouts - replacing Button with AppCompatButton, TextView with AppCompatTextView, etc. to ensure that each could support tinting. In this release, those tint aware widgets are now publicly available, allowing you to keep tinting support even if you need to subclass one of the supported widgets. 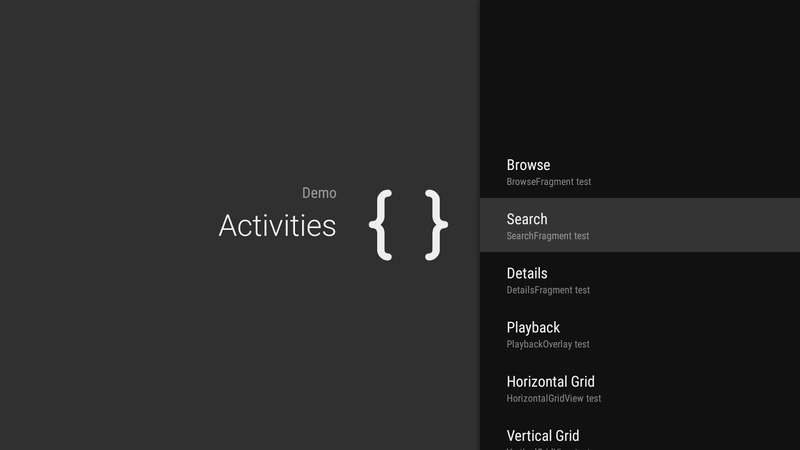 Lollipop added the ability to overwrite the theme at a view by view level by using the android:theme XML attribute - incredibly useful for things such as dark action bars on light activities. Now, AppCompat allows you to use android:theme for Toolbars (deprecating the app:theme used previously) and, even better, brings android:theme support to all views on API 11+ devices. With the Leanback library serving as the collection of best practices for Android TV apps, we’d be remiss to not make an even better 10’ experience as part of the release with the new guided step functionality. This set of classes and themes can be used to build a multiple step process that looks great on Android TV. 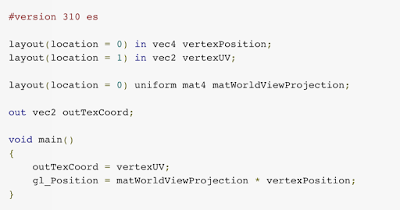 It is constructed from a guidance view on the left and a list of actions on the right. Each is customizable via themes with a parent of Theme.Leanback.GuidedStep or, if even more customization is needed, through custom a GuidanceStylist and GuidedActionsStylist. You’ll also find a large number of bug fixes, performance improvements, and an extra coat of polish throughout the library - all with the goal of making the Leanback experience even better for users and developers alike. Besides a healthy set of bug fixes, this release adds a new SortedList data structure. This collection makes it easy to maintain a sorted list of custom objects, correctly dispatching change events as the data changes through to RecyclerView.Adapter: maintaining the item added/deleted/moved/changed animations provided by RecyclerView. In addition, SortedList also supports batching changes together, dispatching just a single set of operations to the Adapter, ensuring the best user experience when a large number of items change simultaneously. If you’ve been using Palette to extract colors from images, you’ll be happy to know that it is now 6-8 times faster without sacrificing quality! Palette now uses a Builder pattern for instantiation. Rather than directly calling Palette.generate(Bitmap) or their equivalents, you’ll use Palette.from(Bitmap) to retrieve a Palette.Builder. You can then optionally change the maximum number of colors to generate and set the maximum size of the image to run Palette against before calling generate() or generateAsync() to retrieve the color Swatches. Renderscript gives you massive compute potential and the Support Library version makes a number of the pre-defined scripts, called script intrinsics, available to all API 8+ devices. This release improves reliability and performance across all devices with an improved detection algorithm in determining whether the native Renderscript functionality can be used - ensuring the fastest, most reliable implementation is always chosen. Two additional intrinsics are also added in this release: ScriptIntrinsicHistogram and ScriptIntrinsicResize, rounding out the collection to ten. There’s no better time to get started with the Android Support Library. You can get started developing today by downloading the Android Support Library and Android Support Repository from the Android SDK Manager. To learn more about the Android Support Library and the APIs available to you through it, visit the Support Library section on the Android Developer site. For Jelly Button Games, understanding users is the key to creating and maintaining a successful game, particularly when growth relies on moving into overseas markets. The team makes extensive use of Google Analytics and Google BigQuery to analyze more than 3 billion events each month. By using this data, Jelly Button can pinpoint exactly where, when, and why people play their highly-rated game, Pirate Kings. Feeding this information back into development has driven active daily users up 1500 percent in just five months. We caught up with Mor Shani, Moti Novo, and Ron Rejwan — some of the co-founders — in Tel Aviv, Israel, to discover how they created an international hit and keep it growing. Analyze — discover the power of data from the Google Play Developer Console and Google Analytics. Query — find out how Google BigQuery can help you extract the essential information you need from millions or billions of data points. Localize — guide the localization of your app with best practices and tools. There are thousands of Android developers creating experiences for families and children — apps and games that broaden the mind and inspire creativity. These developers, like PBS Kids, Tynker and Crayola, carefully tailor their apps to provide high quality, age appropriate content; from optimizing user interface design for children to building interactive features that both educate and entertain. Google Play is committed to the success of this emerging developer community, so today we’re introducing a new program called Designed for Families, which allows developers to designate their apps and games as family-friendly. Participating apps will be eligible for upcoming family-focused experiences on Google Play that will help parents discover great, age-appropriate content and make more informed choices. Starting now, developers can opt in their app or game through the Google Play Developer Console. From there, our team will review the submission to verify that it meets the Designed for Families program requirements. In the coming weeks, we’ll be adding new ways to promote family content to users on Google Play — we’ll have more to share on this soon. What if there was a way for drivers to stay connected using your messaging app, while keeping their hands on the wheel and eyes on the road? 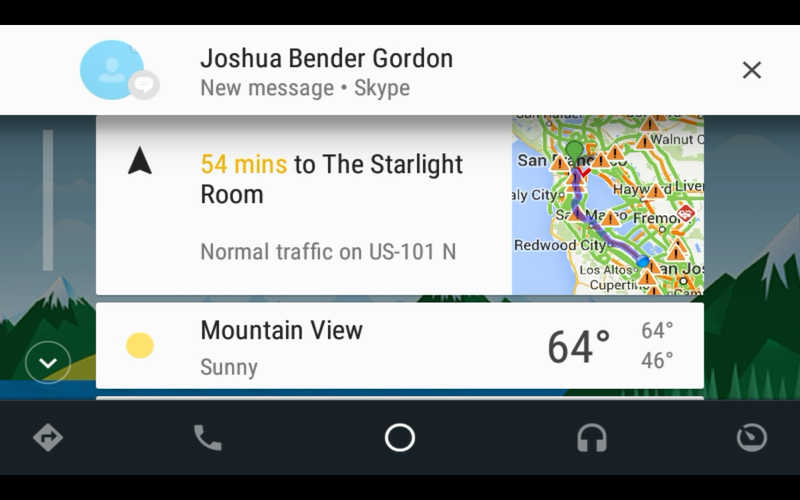 Android Auto helps drivers stay connected, but in a more convenient way that's integrated with the car. It eliminates the need to type and read messages by replacing these activities with a voice controlled interface. Enabling your messaging app to work with Android Auto is easy. Developers like Skype and textPlus have already done so. Check out this DevByte for an overview of the messaging APIs, and see the developer training guide for a deep dive. Read on for a look at the key steps involved. When an Android 5.0+ phone is connected to a compatible car, users receive incoming message notifications from Auto-enabled apps on the car’s head unit display. Your app runs on the phone, but is controlled by the car. 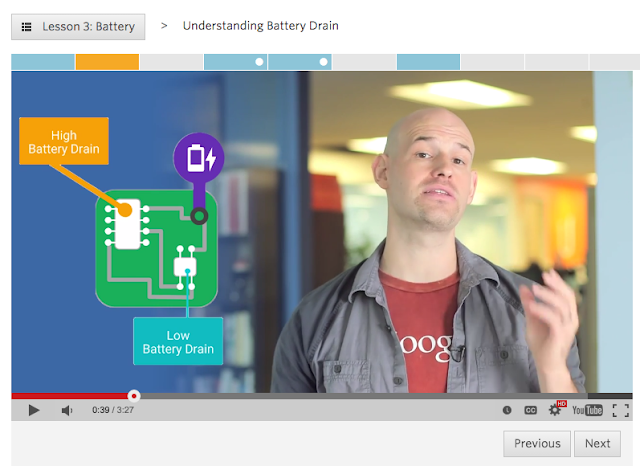 To learn more about how this works, watch the Introduction to Android Auto DevByte. If your app already uses notifications to alert the user to incoming messages, it’ll be easy to extend these for Auto. It takes just a few lines of code, and you won’t have to change how your app works on the phone. 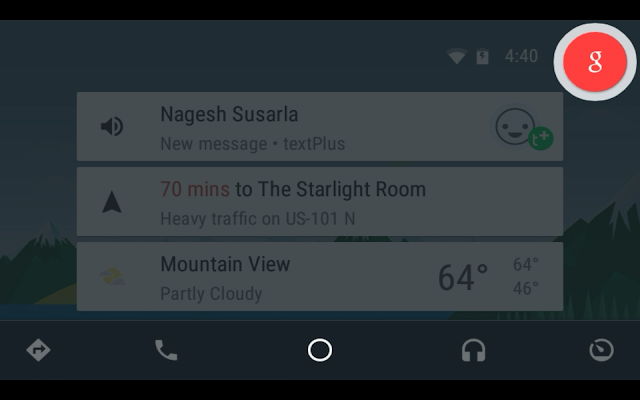 There are a couple small differences between message notifications on Auto vs. a phone. On Auto, a preview of the message content isn’t shown, because messaging is driven entirely by voice. Second, message notifications are backed by a conversation object. This is simply a collection of unread messages from a particular sender. Decorate your notification with the CarExtender to add support for the car. Next, use the UnreadConversation.Builder to create a conversation, and populate it by iterating over your app's unread messages (from a certain sender) and adding them to the conversation. Pass your conversation object to the CarExtender, and you’re done! Tapping on a message notification plays it back on the car's sound system, via text to speech. This is handled automatically by the framework; no additional code is required. Pretty cool, right? In order to know when the user hears a message, you provide a PendingIntent that’s triggered by the system. That’s one of just two intents you’ll need to handle to enable your app for Auto. Voice control is the real magic of Android Auto. Users reply to messages by speaking, via voice recognition. This is far faster and more natural than typing. Enabling this functionality is as simple as adding a RemoteInput instance to your conversation objects, before you issue the notification. Speech recognition is handled entirely by the framework. The recognition result is delivered to your app as a plain text string via a second PendingIntent. Replying to a message from textPlus by voice.